At auction last week I purchased two white vases that have a hidden design visible from the inside of the vase when held to the light, but invisible when viewed from the outside of the vase. The porcelain is very thin and delicate. A label on the vases indicated that they were 19th century, "Hidden Design" vases, but said no more. Regarding your hidden design vases I think they are rather recent. The finial on the lid is typical for late 20th century porcelain even if I can't completely rule out the 19th century either as a possibly date. The ware this vase is made to "be" is an almost "mythical" ware from the first Ming emperor "who made a white ware of very thin porcelain with a design which was only visibly when held up against the light". Mythical, since no one as far as I know have ever seen even a shard of it. The mark on the base says "Guan" which means "Imperial". Several of these very rare, to say the least, items have surfaced recently so there is reason to believe they are all rather recent. I have an unusual white revolving bowl with relief decorated with dragon, phoenix, waves clouds and flaming pearl. When held up to the light, or filled with water with a light shining down on it, a dragon and phoenix finely drawn in blue with clouds and the pearl in red can be seen within the body. 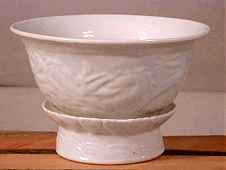 The bowl have a molded "Guan" mark on its base. It is not eggshell but otherwise very similar to the vase above. The interior color does not follow the exterior molding and the fixed-on but freely rotating base is quite a feat in itself. The body and biscuit on this to me suggest a late Qing date which is supposedly the earliest at which these were made, although Bushell in "Oriental Ceramic Art" mention something which sounds very similar, made during the Ming. This is regardless of its age an extraordinary feat of the potters art. Diameter 13,3 cm(5.25"). In regards to the article about "White porcelain with hidden design" under your Antique Chinese Porcelain Questions and Answers section. I am still living in Shanghai and see these two pieces, along with various vases of the same, quite frequently in the markets here. One of the dealers who I stop to see often has gallantly (and hopefully honestly) answered several questions about Chinese porcelain for me. I asked him about the bowl on the revolving base (that just happened to be in the shop next door) and he told me not to buy it for the 100 Yuan (US $12.50) the shop owner wanted for it, but that he could pick up the same thing for me from the factory for 30 Yuan (US $3.75). He says he has dealt in selling for many, many years and has never seen an original of this porcelain. Just thought I'd pass it along for whatever it's worth. I would like to say thank you to all participants in this thread.